Children, including infants, under eight years of age will be admitted only to events specifically designated. A limited number of assisted-listening devices are available. Patrons who require such devices should inform an usher when they arrive at the event. Large cameras with detachable lens are not permitted. Photographs and personal recordings are not permitted during the meeting or performance. Cell phones, tablets, and similar electronic devices are allowed during the event. Laptops are prohibited. Food and beverages are not permitted in performance halls. Water is allowed in clear plastic water bottles only. Metal water bottles are prohibited. An interpretation device may be arranged for a specific event. Patrons who require this service should inform the ticket office two weeks prior to the event. 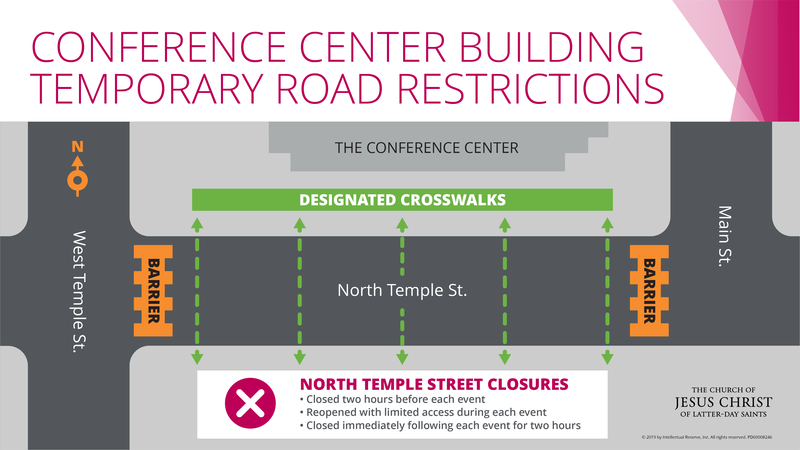 During major events in the Conference Center, North Temple between Main Street and West Temple will be restricted to pedestrian access. Restrictions will start two hours before the event. Event venues will not be accepting or storing any personal items. Large bags, backpacks, and packages are prohibited. Small bags and purses will be allowed into the event but will be screened. Those attending should consider traffic congestion, plan to arrive early, and park in designated parking areas only. Visit Events on Temple Square, Conference Center Events, and Conference Center Theater Events for additional parking information. For events on Temple Square, patron seating begins one hour before the scheduled event start time. For events in the Conference Center, seating begins 90 minutes before the event starts. Those with tickets should be in their seats half an hour before the event start time. Standby seating is available on a first-come-first-served basis. The standby line will form at the north gate of Temple Square. Patrons with service animals will be directed to the overflow venues. Comfort animals are prohibited. Some wheelchair-accessible seating is available in all buildings. Patrons who require such seating should inform the ticket office when they obtain tickets, or an usher when they arrive at the event. Patrons who enter the building in a wheelchair should remain in their wheelchair for seating during the event. Weapons of any kind, including concealed-carry permit holders. Large cameras with detachable lenses, tripods, or selfie sticks. Whistles, horns, noisemakers, or fireworks. Security has the right to prohibit any other items at their discretion.